CARBONDALE, Ill. — Judicial appointments and threats to an independent judiciary in the African nations of Botswana, South Africa and Swaziland will be discussed at the SIU School of Law later this month. 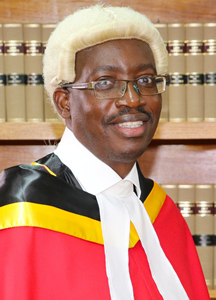 Honorable Professor Justice Oagile Bethuel Key Dingake will present the 2019 Beatty Jurist-in-Residence lecture at 5 p.m. Jan. 29 in the Hiram H. Lesar Building Courtroom at SIU Carbondale. “Appointment of Judges and the Threat to Judicial Independence: Case Studies from Botswana, Swaziland, South Africa and Kenya” is free and open to the public. During his week at the law school, Dingake (Dee-nya-keh) will visit classes and meet with faculty. Oagile Bethuel Key Dingake (Oo-aa-gh-ee-leh Beth-yoo-el Key Dee-nya-keh) will be available for interviews Jan. 28 at the SIU School of Law. Reporters, photographers and camera crews are welcome to attend the Beatty Jurist-in-Residence lecture at 5 p.m. on Jan. 29 in the SIU School of Law Courtroom. To arrange for interviews, contact Michele Mekel, director of external relations, at mmekel@siu.edu or 618/453-8768. Christopher W. Behan, a professor at the law school, met Dingake in 2014 while teaching a trial advocacy course in Gaborone, Botswana, with Justice Advocacy Africa. The two maintained contact through the Legal Globalization and Comparative Law: Botswana and South Africa course that Behan and Professor Mark Schultz teach. Behan and Schultz met with Dingake during their most recent visit to Botswana in 2018 to work out preliminary arrangements for the lecture. Behan said judicial independence is under attack throughout sub-Saharan Africa in ways not often experienced in the United States, noting there is tension between the executive branch in Botswana and the judiciary. One case involved whether individual judges can criticize the chief judge of the nation’s high court. Dingake said a “major test case of national importance involving the independence of the judiciary in Botswana” held that the nation’s president could not reject a nominee approved for appointment by the nation’s judicial service commission.